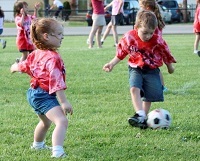 Soccer can be a perfect sport for young players and parents to play together. KidsPlay PC soccer is a parent-child class designed to give young players a fun and interesting introduction to soccer during their formative years. The first 30 minutes of each session focuses on fun instructional games that parents and children can play together. The final 15 minutes is devoted to a “players only” scrimmage. A team shirt is included in the program fee. Please note that PC Soccer is a parent-child activity. An active parent or guardian 18 years or older must accompany a child in each session. All players must be of age by the first scheduled class. Please read: Ages 3-4 yrs. An active parent or guardian 18 years or older must accompany a child in each session. All players must be of age by the first scheduled class.